Daily Illuminator: Two New GURPS Classics Available On Demand! July 2, 2018: Two New GURPS Classics Available On Demand! Two more GURPS Third Edition classics have joined our On Demand program, available in print once again! 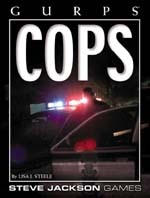 GURPS Cops is a look at those who protect the streets, including the history of police forces, an examination of different police roles, and a guide to investigations. 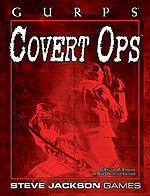 GURPS Covert Ops offers insight into those who do their dirty works in the shadows . . . and those who work to stop them. Add assassins, saboteurs, and terrorists to your campaign, whether it's modern, historical, science fiction, or fantasy. Although these were designed for Third Edition, they still have lots of great insight for GURPS Fourth Edition . . . or any game system. If you love having your gaming supplements as physical books at your table, then we've listened to your demand . . . On Demand – with GURPS!